"YOU will break ribs" – these words highlight the shocking reality of a life and death situation which anyone could find themselves in. Sudden Cardiac Arrest kills around 100,000 people a year in the UK and Stone-based charity AEDdonate is on a mission is to get more Automated External Defibrillators (AEDs) installed in communities to change that. The charity has installed around 830 across the UK. An external defibrillator costs around £2,000 and AEDdonate helps people fundraise for them. 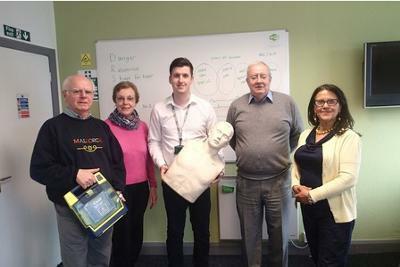 Jamie Richards, chief executive of AED Donate, pictured left, said: "We're a one-stop-shop because we help people fundraise, buy the device, install it and the box, register it and we maintain it. We want to make it as easy as possible to get these." What do you do if you think someone may have gone into cardiac arrest? First check you and the patient are in a safe place. Then check for a response by gently tapping their upper chest and pinching their earlobes. Shout for help and get someone to call 999. While this is happening check the patient's airway by tilting their head back and looking down their throat to ensure it's clear. Lean down and put your ear to their nose and mouth while feeling their chest to see if they are breathing. It is at this point you begin CPR by placing one hand over the other and pressing down in quick succession in the centre of the person's upper chest, on the breast plate. You can pause after every 30 compressions to administer mouth-to-mouth. It is not unusual to hear ribs crack, but it is important to keep going. While this is happening have someone run and fetch the nearest defibrillator. When they called 999, the emergency services will have told them the nearest device and will have given them a code to open the box. The device will provide audio instructions and will ask the person administering CPR to stop while it assesses the heartbeat. It will then charge and ask the user to press a button to administer the shock. If the patient wakes up turn them over into the recovery position.